Go to original pattern for design DROPS 83-15. DROPS 5 mm [US 8] double-pointed and straight needles, and 6 mm [US 10] needles, or sizes needed to obtain correct gauge. 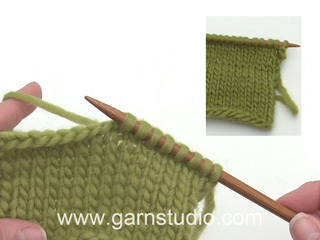 Gauge: 15 sts x 19 rows with 1 strand Karisma Superwash + 1 strand Vivaldi on larger needles in stockinette st = 10 x 10 cm. Rib: * K 2, P 3 *, repeat * - *. Front: Cast on 62-72-77-82-92 sts on smaller needles with 1 strand army green mix Karisma Superwash + 1 strand Vivaldi. 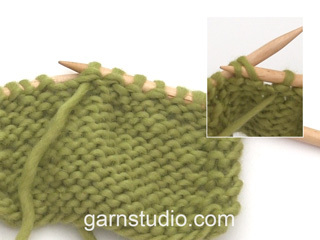 Knit rib for 4 cm, keeping 1 edge st at each side in garter st. Change to larger needles and stockinette st and follow Pattern 1, adjusting (inc/dec) to 64-70-76-83-91 sts on the 1st row. After Pattern 1, knit Pattern 2 and then continue in the last stripe colors to finished measurements. When the piece measures 11 cm inc 1 st at each side every 8-8.5-9-9.5-10 cm a total of 3 times = 70-76-82-89-97 sts. When the piece measures 35-36-37-38-39 cm bind off for armhole at each side every other row: 3 sts 1 time, 2 sts 0-1-2-3-4 times and 1 st 2-2-3-4-5 times = 60-62-62-63-65 sts. 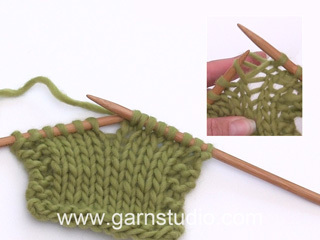 When the piece measures 47-49-51-53-55 cm bind off the center 14-14-14-15-15 sts for the neck. Bind off at each neck edge every other row: 2 sts 1 time and 1 st 3-4-4-4-4 times = 18-18-18-18-19 sts remain on each shoulder. Bind off when the piece measures 55-57-59-61-63 cm. Cast on and knit the same as the front. Bind off for armhole as on front. When the piece measures 53-55-57-59-61 cm bind off the center 22-24-24-25-25 sts for the neck. On the next row dec 1 st at each neck edge = 18-18-18-18-19 sts remain on each shoulder. Bind off when the piece measures 55-57-59-61-63 cm. Cast on 58-58-58-65-65 sts on smaller needles with 1 strand army green mix Karisma Superwash + 1 strand Vivaldi. 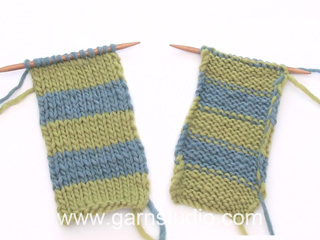 Establish rib as follows and follow stripes in Pattern 3: Row 1 (right side): K 1 (edge st knit in garter st), * K 2, P 5 *, repeat * - * and finish with K 1 (edge st knit in garter st). Row 2: K 1 (edge st knit in garter st), * P 2, K 5 *, repeat * - * and finish with K 1 (edge st knit in garter st). After Pattern 3 knit Pattern 4, and then with the colors in last stripe to finished measurements. When the piece measures 8 cm dec all P 5 to P 4 (as seen from right side) = 50-50-50-56-56 sts. 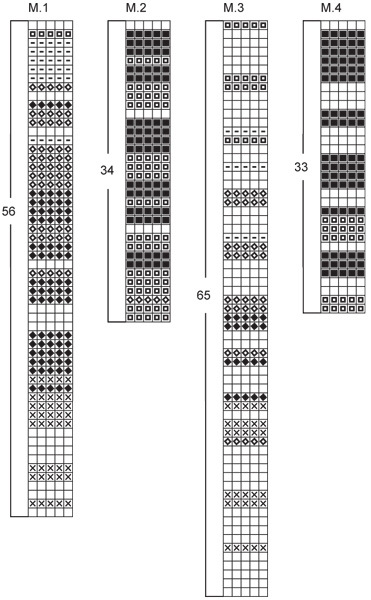 When the piece measures 18 cm dec all P 4 to P 3 = 42-42-42-47-47 sts. When the piece measures 22 cm change to larger needles and stockinette st, adjusting (inc/dec) to 41-43-43-46-46 sts on the 1st row. When the piece measures 23 cm inc 1 st at each side every 3.5-2.5-2-2-1.5 cm a total of 7-9-11-10-12 times = 56-60-64-67-71 sts. When sleeve measures 48-47-47-45-44 cm bind off for sleeve cap at each side every other row: 3 sts 2 times, 2 sts 2 times and 1 st 1-1-2-3-4 times, then 2 sts at each side until the piece measures 54-54-55-55-56 cm, and then bind off 3 sts 1 time at each side. Bind off the remaining sts, the piece measures approx. 55-55-56-56-57 cm. Collar: Pick up 65-75 sts (divisible by 5) around the neck on smaller double-pointed needles with 1 strand burgundy Karisma Superwash + 1 strand Vivaldi; join and place a marker at the join. P 1 row and K 1 row. Then knit rib. 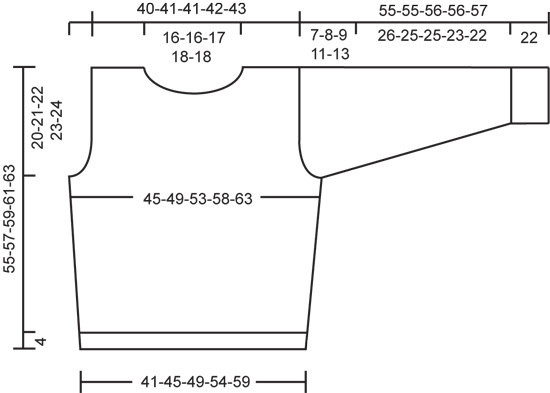 When the collar measures 10 cm inc all P 3 to P 4 = 78-90 sts. Bind off in pattern when the collar measures 13-14-14-15-15 cm.